After more than a decade of constant decline, music industry executives finally have reasons to celebrate. According to the latest Nielsen Soundscan survey, US music sales are up 1.6 percent due to strong digital sales. More precisely, sales of digital tracks rose a notable 16.8 percent while sales of individual tracks upped a healthy 9.6 percent. Physical albums, however, remain on a downward spiral with an 8.3 percent decline while CD sales declined 8.8 percent overall. 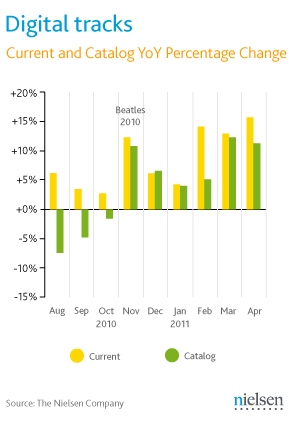 Interestingly, the research firm cited the arrival of Beatles on iTunes for the rebound in digital music sales. Catalog album sales are up 5.4 percent in 2011, thanks in part to a long-awaited 2010 deal allowing digital distribution of The Beatles’ albums for the first time. This is a pretty important change considering that the music industry has been on a downhill ride for more than ten years now. It also proves that online stores like Apple’s iTunes and Amazon’s MP3 store continue to lead the charge in the digital music revolution. The digital space should also benefit from Apple’s rumored entrance into the cloud locker market, giving cloud music service the much-needed legitimacy. Google and Amazon were first to market with branded cloud locker solutions, but without the appropriate licensing agreements from the labels in place, the move that is said to have angered music industry executives. The music industry is reportedly turning to Apple in the hope of forcing competitors into paying royalties for allowing users to store digital files in the cloud.